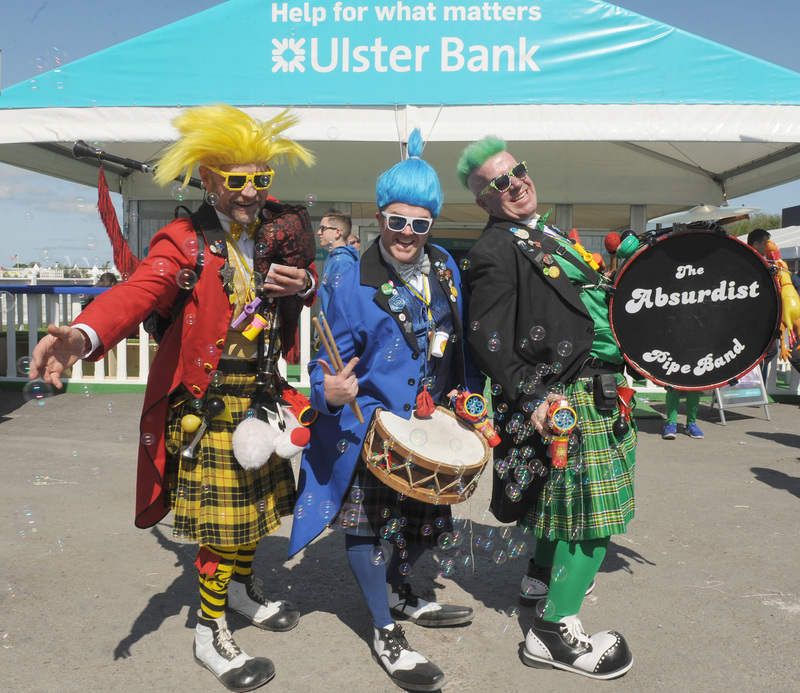 The 150th annual Balmoral Show took place last week, see our gallery below. 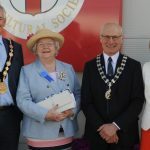 Councillor Tim Morrow (Mayor of Lisburn & Castlereagh City Council), Fionnuala Cook (Vice Lord Lieutenant of County Down) Cyril Millar (President of the Royal Ulster Agricultural Society) and the, Hilary Morrow Mayoress of Lisburn & Castlereagh City Council) pictured at the Balmoral Show. 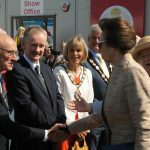 Councillor Tim Morrow (Mayor of Lisburn & Castlereagh City Council) and the Mayoress, Hilary Morrow pictured welcoming Princess Anne to the Balmoral Show. 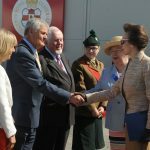 Cyril Millar (President of the Royal Ulster Agricultural Society) pictured welcoming Princess Anne to the Balmoral Show. 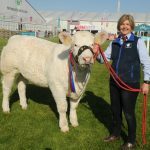 At the WI Marquee at the Balmoral Show is L to R: Pamela Brown (Treasurer), Margaret Kelso (Home & Garden), Collette Craig (Chairman of the Federation of Womens Institutes), Edwina Mark (Vice-Chairman), Agnes Kennedy (Balmoral Committee), Agnes Black (International Committee) and Sophia Maybin (Homecraft). 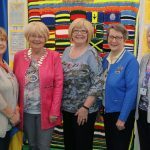 At the WI Marquee at the Balmoral Show is L to R: Pamela Brown (Treasurer), Margaret Kelso (Home & Garden), Collette Craig (Chairman of the Federation of WIs NI), Edwina Mark (Vice-Chairman), Agnes Kennedy (Balmoral Committee), Agnes Black (International Committee) and Sophia Maybin (Homecraft). 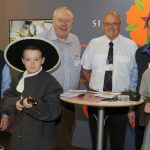 Seamus Close OBE (Freeman of the City of Lisburn) and his wife Deirdre pictured with their son Stephen, daughter-in-law Rachel and their grandson Thomas at the Air Ambulance NI stand at the Balmoral Show. 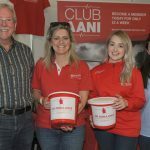 Included are fundraisers Colleen Milligan and Christine Armour. 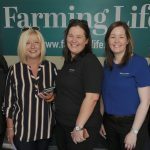 Kim Gildernew, Martine Lafferty, Diane Burke, Gillian Devaney and Tina Evans pictured at the Farming Life stand at the Balmoral Show. 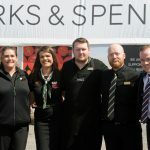 Killian Connolly, Manager (right) and staff pictured at the Marks and Spencer marquee at the Balmoral Show. 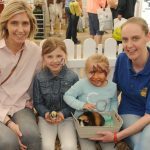 Judith Chestnutt from Cranfield and her daughters Charlotte and Emilie pictured with Katherine Ward at the Ark Open Farm marquee at the Balmoral Show. 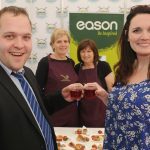 Neil, Grace and Nicola Clark from Magherafelt pictured at the Balmoral Show. 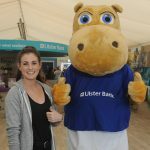 Dani Sterling and Henry Hippo pictured at the Ulster Bank marquee at the Balmoral Show. 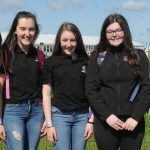 Girls from Magherafelt High School enjoying the craic at the Balmoral Show. 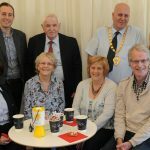 L to R (seated) Diane Dodds MEP, Lis Thompson, Margaret Artt and Roger Thompson and (back row) Paul Givan MLA, John Kelly, Cllr Paul Reid (Mayor of Mid & East Antrim) and Michelle McIveen MLA pictured at the Diane Dodds marquee at the Balmoral Show. 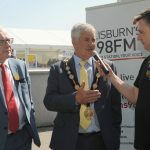 At the Official Opening of the Lisburn & Castlereagh City Council marquee at Balmoral Show are Alderman Allan Ewart MBE (Chair of Development Committee), Councillor Tim Morrow (Mayor) and Lisburns FM98 Radio Co-ordinator Colm McAlinden. 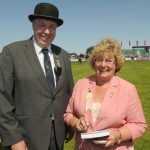 David Cunningham (Show Jumping Arena Chief Steward) and Myrtle Peak (President of Show Jumping) pictured at the Balmoral Show. 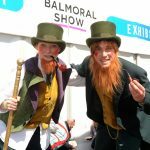 The leaping Leprechaun and Rick OShea adding a little fun at the Balmoral Show. 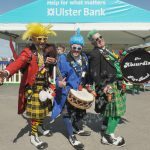 The Absurdist Pipe Band adding a bit of fun at the Balmoral Show. 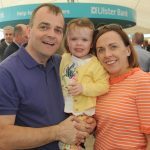 Cllr Ben Mallon and his wife Emma and their daughter Annie pictured at the Lisburn & Castlereagh City Council marquee at the Balmoral Show. 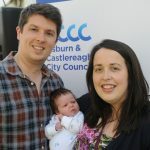 Newlyweds Cllr Nathan Anderson and his Californian wife Rachel pictured at the Lisburn & Castlereagh City Council marquee at the Balmoral Show. Included are Doreen Brett and Jennifer Patterson (Brown Bean, Lisburn). 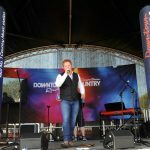 Country singer Derek Ryan pictured entertaining an appreciative audience at the Downtown Country stage at the Balmoral Show. 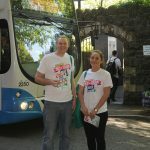 Andrew Blom and Emma Whytel (Translink) pictured meeting people as they arrive at Lisburn Train Station for the free shuttle bus service to the Balmoral Show.